Time for a Christmas special about Santa and we already saw that the last one didn’t fare quite as well as the average special. Unfortunately, that continues as The Year Without a Santa Claus may have ended up being the least interesting Christmas Special to date. Perhaps Santa Claus just isn’t cut out to be the main character of a film. It could also just be a bad roll of the dice and then he can get em all next year. Well, the plot is pretty self explanatory from the title. Santa is feeling tired and sick this year. His doctor lets him know that nobody cares about Santa or Christmas anymore and Santa quickly buys this story. He decides to take a day off and his two elves are sad about it. Ms. Claus thinks about being Santa herself, but ultimately decides not to do it. Her Elves must now find some Christmas spirit in South Town to show Santa that there is still hope. One thing leads to another and one of Santa’s reindeer is placed at the pound. Can the Elves make it snow in Southtown so that the Mayor can believe them and free the Reindeer? It’ll be a pretty dicey challenge for the heroes. Well, the biggest problem with the film is that it’s simply uninteresting. Santa isn’t really the main character since he’s taking a break so the two elves…I guess I’ll just say their names, Jingle and Jangle must team up with Ms. Claus to be the main characters. They mean well, but they are definitely not main character material. Jingle and Jangle making mistakes and one of them beating up the other one gets old very quickly and Ms. Claus is a nice person, but her type of character isn’t great for the lead. She’s the nice old lady that everyone is actually afraid of and I’ll admit that I’ve never been a fan of this kind of character. It’s decent comic relief I suppose, but the film can certainly do better. Things get a bit better once Snow Miser and his brother Heat Miser show up. First we have to listen to their songs of course and then we get to see a display of their abilities. I think it’s safe to say that Heat Miser would probably win in a fight, but Snow Miser is a lot more reasonable and he is definitely the better character. This guy doesn’t miss a beat and he’s always ready to throw a little snow your way. These two added a supernatural effect to the special and then we got to meet their boss. Once again, the film tripped a little in how it handled the situation. Mother Nature was a being that scared even Ms. Claus and everyone talked about how tough and vicious she was. Then…she’s actually a really nice lady who scares the two Misers. It was not entirely unexpected, but it was still not a great twist and you’ll probably wince a few times. “This can’t be happening” is something that you might say as she forces the Misers to compromise. Even the ending is rather odd as the moral is that the kids decide to give Santa his own holiday so he can rest. It’s all going well until one kid can’t hold her feelings back any longer and guilt trips Santa by letting him know that her Christmas is going to be terrible without him. The other kids start to cry too until they finally force Santa to don his old costume and take up the tradition once more. The holiday is cancelled and you wonder what the point of it all was. What just happened here? The film certainly made me drowzy as it powered through all of the tropes imaginable. At least the Reindeer got a happy ending since everyone else wasn’t doing very well at the time. I will admit that the Mayor was a pretty great character since he mocked the heroes until the bitter end. He even danced with a little kid to show just how tough he was when he let the elves know that he wouldn’t release the Reindeer. He’s just that kind of guy, he’d rather let the animal stay at the pound than find him an owner. It’s the kind of thing that could definitely make him unlikable, but I like to think that this is a nice pound where the animals are cared for. Overall, This film was a bit of a miss compared to the other Christmas specials. There is no sense of wonder or amazement here. You can’t even really call it a cheerful/happy film. Santa definitely doesn’t look good here and the film never really knew where it wanted to go with the plot. Ms. Claus’ decision to abandon her Santa adventure was so sudden that you know a last second script re write must have happened. If only the characters had been more interesting, the film could have had some hope. I can’t recommend this film and you should watch A Charlie Brown Christmas instead. 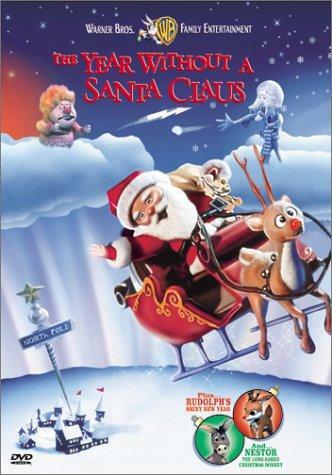 This entry was posted in Animated Movie Reviews, Animated Movies, Reviews and tagged Christmas, Christmas Review, Film Review, Ms Claus, Reindeer, Review, Santa Claus, The Year Without a Santa Claus by dreager1. Bookmark the permalink.